Q. I love vitafusion™ MultiVites. Do you have anything for kids? A. Yes, L’il Critters™ is the #1 Gummy Vitamin brand for kids†! You can find them in the vitamin aisle at retailers nationwide. †Data on file. Q. How much calcium is in the vitafusion™ Calcium Gummy Vitamins? A. A serving of vitafusion™ Calcium delivers 500 mg of calcium, as much as two 6 oz glasses of milk. Q. Your MultiVites have vitamin C in the formula. Is it safe to consume MultiVites along with the Power C™ which also contains vitamin C? A. Consumers should consult with their health care professional about taking multiple dietary supplements. Q. What is the source of the coloring used in the vitafusion™ products? A. Most products use colors from plants, fruits, and vegetables, not FD&C Red #40, Blue #1, or Yellow #6. Specific colors can be found on each product label. Q. What is lactic acid? Is it from milk? A. Lactic acid is a natural preservative and flavor enhancer. It is not produced from milk. Q. Are vitafusion™ product bottles recyclable? A. Yes. We use only #1 and #2 recyclable bottles, which are BPA-free. Q. Where is a good place to store my gummy vitamins? A. vitafusion™ gummy vitamins should not be exposed to excessive heat or moisture. They should also be kept out of the reach of children. Q. Do you test for mercury in the vitafusion™ Omega-3 and PreNatal Gummy Vitamins? A. Yes. vitafusion™ Omega-3 and PreNatal Gummy Vitamins contain high quality, purified and concentrated fish oil that is tested for heavy metals (such as mercury and lead). 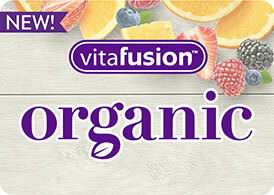 Q: Where is vitafusion™ made? A: All products are made in the USA. Q: How many calories does each vitafusion™ product serving have? A: vitafusion™ products have between 5 and 30 calories per serving. Please check the specific product label for the amount of calories per serving. 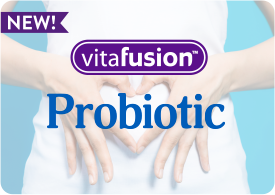 Q: Are vitafusion™ approved by the Food and Drug Administration? A: As dietary supplements, vitafusion™ products are regulated by the Food and Drug Administration. We comply with FDA laws and regulations, including current Good Manufacturing Practices for dietary supplements. Q: How do the actives of vitafusion™ compare to non-gummy vitamins? A: vitafusion™ products provide similar benefits as traditional vitamin tablets or capsules that have the same nutrient types and amounts. Q : What is vitafusion™ CoQ10 and what are the benefits? Q: Are vitafusion™ products bad for consumers’ teeth due to the gummy consistency? A: We recommend consumers brush their teeth after consuming this product, just like they would for any other food. We recommend consumers consult with their dentist if they have specific concerns.